Celebrate any special occasion with our quality range of personalised t-shirt designs for Dad or Mum! Whether it's Father's Day, Mother's Day or your family's First Christmas, you can mark the occasion with a t-shirt design that matches perfectly with our cute kid's clothing designs. With a variety of sizes available, it'll be your go-to gift every year! There's nothing like a personalised t-shirt to create a fun and unique look that everyone will love. These 100% cotton shirts feature bright and vivid designs that are printed on demand to your white t-shirt. With a variety of sizes available, you'll want to design your own shirt and make one for the whole family. I had a T-Shirt made up for dads first Fathers Day. The T-shirt was a great fit and true to size. The printing is of great quality too! Ordered some men and women’s t shirts and the women’s sizing is a little small. Great gift ideas but bigger sizes would be good. Fast shipping and good design choices. Bought this for Father's Day, was a good, standard quality t-shirt and fit was slightly small (M). Daddy doesn't want to take it off! Been looking for one of these for a long time. Print seemed a bit lighter than expected but otherwise am happy with the product. I bought this T shirt for my husband as Father's Day Gift !!! And he loves it very much !!! My husband loves having his back rubbed so this was perfect. My little one for to enjoy playing on a 'track' with his cars while my husband got to enjoy a 'back rub'. Works out perfectly! Enjoyed by all!! Could be bigger! Great shirt. Sizes a little small comparing to other brands. Hubby says tight at the neck. My son enjoyed using it too!! Love that I can personalise a t-shirt and have it arrive within one week in the post. Very happy. I ordered two shirts. I found adjusting the text to make it even hard using the tool provided, so I wrote a note when checking out and everything was fixed perfectly just as I asked. Love the shirts I ordered! I had searched everywhere for a No 1 Dad t-shirt and could not find one that I liked. This t-shirt is perfect! I even requested not to have the banner at the bottom and my request was fulfilled with no dramas or mistakes. Very happy with it! A fun tee that matches well with the cute personalised babysaurus tee. Was prompt delivery. Great quality. Please click the 'Description' tab to see a complete size guide. Please keep in mind that our men's t-shirt sizes are a wide fit size as opposed to a slim fit size. 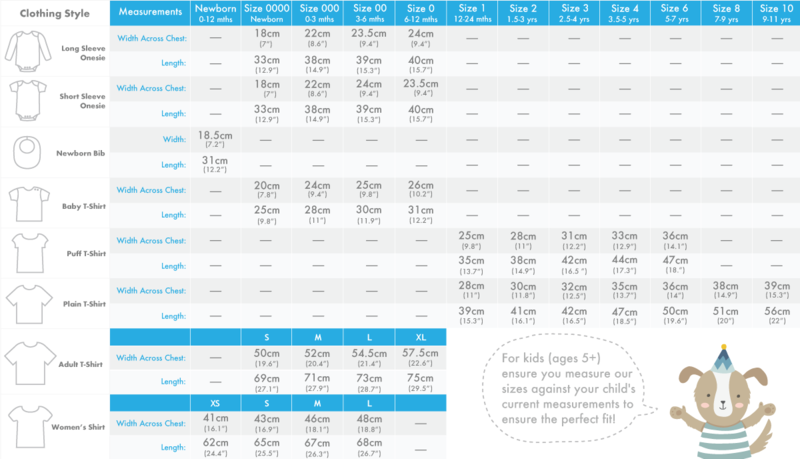 As each person varies in size we recommend you measure him and choose a size based on our width and height measurements displayed in our size guide.